Cinema is an excellent medium of delivering a single message on a universal level. It is indeed, true in the case of Saving Face - a documentary directed by Sharmeen Obaid Chinoy and Daniel Junge. 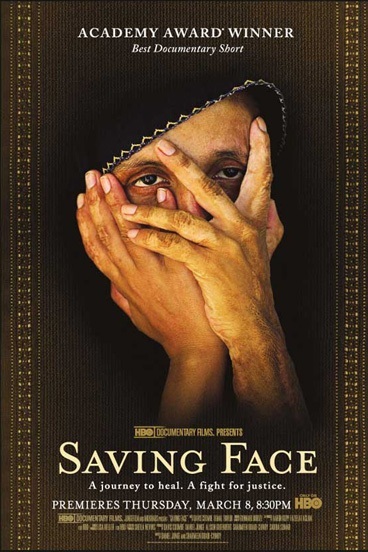 Saving Face brings to light the real life incidents of hundreds of women who are attacked with acid in Pakistan, their survival stories and their fight for justice. A closer look inside Pakistan’s social scene, the film tells the stories of two courageous women: 39-year-old Zakia and 25-year-old Rukhsana. Her husband victimized Rukhsana while Zakia husband and in-laws set her on fire with the use of acid and gasoline. Seeking help from The Acid Survivors Foundation in Islamabad, as well as skilled doctors and supportive policymakers, they try to move forward with their lives, despite trauma and enduring pain. Saving Face also follows the charitable work of Dr. Mohammad Jawad, a plastic surgeon who helped the acid victim survivors go beyond this horrific act and move on with their lives. The documentary also trails the push to enact new legislation that imposes stricter sentencing of perpetrators of acid attacks. Zakia’s husband is convicted of the assault and given two life sentences, becoming the first person to be sentenced under Pakistan’s stronger new law. The film has been awarded the 2012 Academy Award for Best Documentary (Short Subject), making its director, Sharmeen Obaid-Chinoy, Pakistan's first Oscar winner. With this, Sharmeen has managed to bring out an imperative issue that revolves around the society, along with bringing immense pride to the nation. While many Pakistanis appreciate Sharmeen’s work to voice out important subjects of society, few of them also criticize her by labeling her country as “backward”. Sharmeen Obaid Chinoy demonstrated the power of women. She has shown that it does not always have to be a man to bring about a change. She has redefined the definition of women in Pakistan, breaking the usual stereotypes related to them. She has restored faith in the women empowerment, and deserves to be a source of pride not just to Pakistanis, but the whole world. Click here to know more or to get invovled.